In this beer blog, we are going to get a new beer, which is 4 Star Pilsner, from Goose Island Brewery. When this beer was first released it was known as Blue Line Pils. If you read my earlier beer blog posts on their beers, you know the history of this Chicago base craft brewery. It has a clear golden color with a white constant head on this pilsner. There is really no smell. It is hard to pick up. The taste has a slight sweet malty to a dry crisp hop aftertaste. It is extremely drinkable. 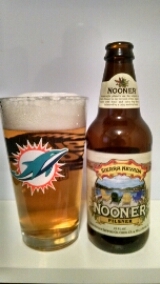 In this beer blog, we are going to sample the new brew, which is Nooner Pilsner, from Sierra Nevada Brewery. If you read my earlier beer blog posts on their beers, you know the history of this west coast craft brewery. If you have not, please, read them to get to know Sierra Nevada Brewery. Let us get into new brew. It has a clear golden color with a constant white head on this pilsner. The smell has a sweet malty notes. The taste has a sweet malty to slight hop notes. The aftertaste has a crisp dry finish. It is extremely drinkable. German-style pilsners are the original session beers. Nooner is our version of the classic style, loaded with floral and spicy hop flavor and balanced by a crisp and dry finish. Nooner Pilsner packs big flavor into an easy-drinking beer that’s fit for friends and afternoon adventure. Nooner is our take on the classic German pilsner, filled with bright and zesty whole-cone hop flavor with a crisp, dry finish – the perfect pick for wherever the day may take you. A crisp, hoppy take on the original session beer. Gather your friends, pack the gear, and head out to wherever the day may take you. A midday go-to, Nooner is our take on the classic German-style pilsner—one of the original session beers. Nooner is easy drinking yet packed with the big flavor of spicy and floral whole-cone hops. Its brilliant golden color begs you to take a sip and sink your taste buds into an extremely welcoming beer, full of flavor and balanced by a crisp, dry finish. In this special beer blog, we are going to get into this tenth of twelve beers from Sierra Nevada Beer Camp. 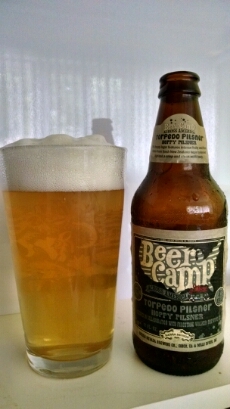 This Pilsner is teamed by Firestone Walker Brewery and it is their Torpedo Pilsner Hoppy Pilsner. If you read my earlier beer blog posts from both of these West Coast craft breweries, you know the history of both of them. If you have not, please, read them to get to know Firestone Walker and Sierra Nevada Brewery. Let us get into this Pilsner. This Hoppy Pilsner has a light golden to straw color with a constant white head. The aroma has a light earthy to sweet malty notes. The taste has a sweet malty to earthy tones with a dry hoppy crisp finish. It is extremely drinkable beer. This hoppy lager features intense fruity and floral notes from fresh New Zealand hops balanced against a crisp and clean malt body. Torpedo Pilsner is a hop-forward take on the crisp, classic lager. We and the folks at Firestone Walker share a passion for New Zealand hop varietals, so we loaded our legendary Hop Torpedo with the southern hemisphere’s finest hops for a fruity, floral twist on the pilsner style. Torpedo Pilsner is a hop-forward take on the crisp classic lager. We and the folks at Firestone Walker share a passion for New Zealand hop varietals, so we loaded our legendary Hop Torpedo with southern hemisphere hops for a fruity, floral twist on the pilsner style. Just down the road from us in California’s Central Coast wine country, this rock star brewery has earned “Mid-size Brewery of the Year” at the World Beer Cup four times. Like us, Firestone is passionate about hops. Their skill with the ingredient shines in their Pale Series and elsewhere in a long beer lineup driven by a premier brewing team. 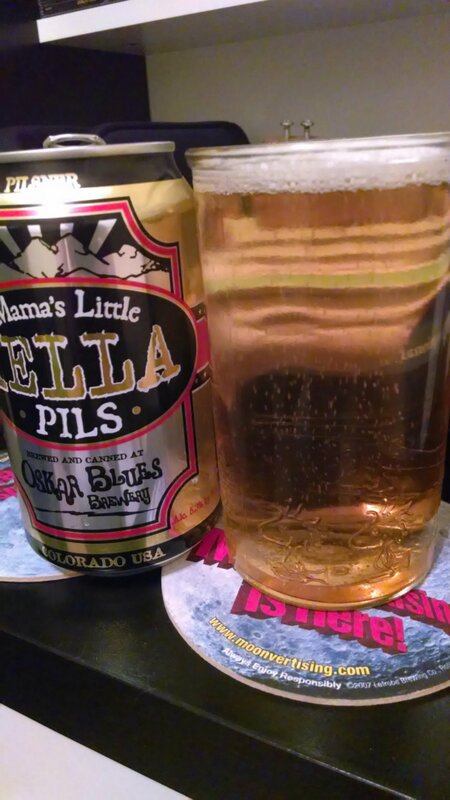 Starting a new tab, Oskar Blues Brewery is the feature brewery and the beer is their Mama’s Little Yella Pils. If you read my earlier beer blog post on their Dale’s Pale Ale, you know the history of this brewery. If you have not, please, read that beer blog post to get to know this brewery better. Let us get into beer. It has a clear golden color with small constant bubbles. It has small constant white bubbles. The smell is of import pilsner and lager. It has a malty notes. The taste of this light body has malty backbone but the hops shine through it. It is a drinkable beer. Oskar Blues’ Mama’s Little Yella Pils is an uncompromising, small-batch version of the beer that made Pilsen, Czech Republic, famous. Unlike mass market “pilsners” diluted with corn & rice, Mama’s is built with 100% pale malt, German specialty malts, and Saaz hops. While its rich with Czeched-out flavor, its gentle hopping (35 IBUs) and low ABV (just 5.3%) make it a luxurious but low-dose (by Oskar Blues standards) refresher.